Nematodes: The super microscopic animal! Nematodes are the greatest animal of which you most likely have never heard! Many of the organisms on earth are too tiny for us to see and are often overlooked. However, they can provide valuable information about ecosystems, the environment and they can be used to model how important processes work in larger animals. Among these groups of super organisms are nematodes. These worm-like animals are often no larger than the tip of a pencil. Although, some species that parasitize animals can grow to be up to 8 meters long, like Placentonema gigantisma which infects sperm whale placentas! Nematodes are considered the most abundant animal on earth because they live in every environment and parasitize almost all other animals (including insects) and plants. In fact, Nathan Cobb, the pioneer of nematology, stated that if everything but nematodes were removed from the earth, we would still be able to discern what had been on the planet based on where different nematode species were! Fig. 1 Hoplolaimus spp. or lance nematode. 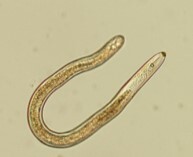 This nematode is found in the soil and feeds on plant roots. Not only are nematodes important in their own right, but they also provide many benefits to the habitats in which they live. For example, they improve plant growth by increasing nitrogen availability to plant roots. On the other hand, their parasitism can destroy crops and hurt livestock. For example, about 20% of the bananas and tomatoes produced each year are lost due to nematode damage . Additionally, many sheep and cattle are infected with parasitic nematodes, which can have negative economic impacts for farmers . Fig. 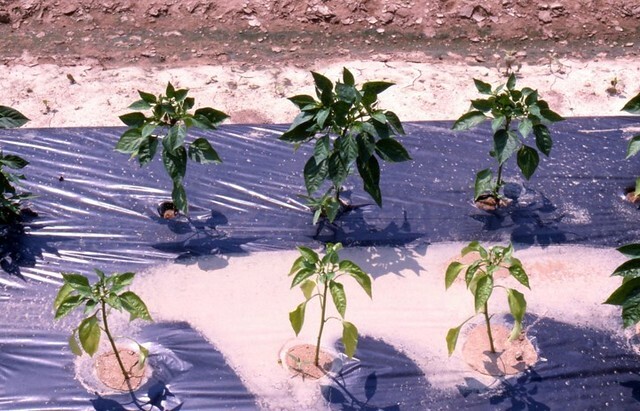 2 The front row of pepper plants are infected with root-knot nematodes while the back row is healthy. Photo Credit: Robert Wick. Many scientists study nematodes because they are fascinating on their own, but many also study nematodes as model organisms to learn about how processes work in other animals. The main nematode species used as a model organism is Caenorhabditis elegans, often referred to as C. elegans. C. elegans has been studied to determine how the animal nervous system works (including mating behavior and chemotaxis), how programmed cell death occurs, and it was important in the discovery of RNA interference! Fig. 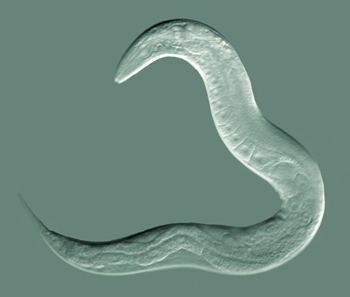 3 C. elegans is often used as a model organism. Photo Credit: Bob Goldstein at UNC Chapel Hill. Fig 4 Video capturing how C. elegans moves. Video Credit: Bob Goldstein at UNC Chapel Hill. By far one of the coolest things about nematodes is their ability to survive in extreme environments. Some nematodes can be found in the extreme cold and dry climate of Antarctica where they use a process called anhydrobiosis, in which they lose almost all the water from their cells to survive until conditions become favorable . Just like zombies coming back to life! Some nematodes also live deep in the Earth’s crust in hot dry conditions with very little oxygen . C. elegans have been sent to space and were the only living survivors of the Columbia crash . Now, it is being studied to provide new insights into how animal brains cope with trauma and possible leading to new treatments for post-traumatic stress disorder in humans [5,6]! Nematodes are pretty incredible, so the next time someone asks you what your favorite animal is, don’t forget about the nematode! Roeber, F., Jex, A.R., Gasser, R.B. “Impact of gastrointestinal parasitic nematodes of sheep, and the role of advanced molecular tools for exploring epidemiology and drug resistance - an Australian perspective”. Parasites and Vectors 6 (2013): 153. Adhikari, B.N., Wall, D.H., Adam, B.J. Desiccation survival in an Antarctic nematode: molecular analysis using expressed sequenced tags. BMC Genomics 10 (2009): 69. Curran, P., Chalasani, S.H. Serotonin circuits and anxiety: what can invertebrates teach us? Invertebrate Neuroscience 12 (2012): 81-92.